We’d love your help. Let us know what’s wrong with this preview of The Power of Dark by Robin Jarvis. Something is brewing in the town of Whitby. To best friends Lil and Verne, it just seems like a particularly bad storm. But Cherry Cerise, the last of the Whitby witches, fears that ancient forces are at work, reviving the curse of a long lost magical artifact. The legend goes th An enthralling mix of magic and horror – first of a new series from fantasy legend Robin Jarvis. To ask other readers questions about The Power of Dark, please sign up. I grew up near Whitby. It's a gorgeous, wild place. It hinges on the great jaws of the West and East Cliff and when you stand there, on that bridge between the two sides of the town, you can feel the whole world rolling in off the sea to greet you. This is a strange, evocative town that you have to earn. Jennet and Ben, back in The Whitby Witches have to earn their presence within Whitby. They don't get there easily nor painlessly, but they end up there when they're needed. When they have to be. I grew up near Whitby. It's a gorgeous, wild place. It hinges on the great jaws of the West and East Cliff and when you stand there, on that bridge between the two sides of the town, you can feel the whole world rolling in off the sea to greet you. This is a strange, evocative town that you have to earn. Jennet and Ben, back in The Whitby Witches have to earn their presence within Whitby. They don't get there easily nor painlessly, but they end up there when they're needed. When they have to be. Whitby is a space between the worlds, a thin gauze between the human and the other, and such a town needs protectors. Aunt Alice was one. Cherry Cerise is another. She's the last of the Whitby Witches; a delicious bit of writing that I can adore and marry for it is perfect. This town has guardians, protectors, and it needs them right now because Whitby is facing its newest - and maybe darkest - hour. Young friends, Lil and Verne, embroiled in events they can't begin to understand have to stand with Cherry and save their town from the brink of destruction. The Power of Dark is the first in a series. A trilogy, I'm guessing. Jarvis fits well into trilogies and the rhythm of them; and this does have the mark of an overarching saga that makes me itch with potential. The Power of Dark is perhaps for a slightly younger audience than you may have expected, but even then, that's a complex call to make because certain scenes are spine tingling and sharp and not to be read in the dark. I suspect this is one that might be quite fluid when it comes to age based reccomendations. When I received The Power of Dark in the mail, I had no idea what to expect. I'd never heard of it before, but it looked really interesting. The cover and synopsis screamed "fantasy," and because it's been a while since I'd last picked up a fantasy book, I decided to jump right into it. It actually took me a while to get into it, not gonna lie. Not because it wasn't good–this one was actually really great–but I was otherwise distracted and would often not be able to read huge chunks in one sitting. I finally did make it through, practically inhaling the second half of the book, and, overall, I found myself pleased with the book. While the characters were a little younger than what you'd typically find in a young adult novel, I did enjoy reading their adventure. Verne and Lil (very suitably named, as well) were fantastic characters, and I enjoyed reading about their own personal conflicts in the midst of the larger problem they both come to face. Cherry was absolutely hilarious and I came to love the magical hippie. At first it was confusing when the narrative jumped to the histories of Annie and Pyke, but the two stories come together and form the foundation for the start of an exciting new series. It was such an interesting concept–magic against machinery. It's truly a gothic novel that harnesses both, and pits them against one another. I really enjoyed the history behind Whitby and the reason for the brewing war between the two sides. It seemed quite strange, the modern-day setting infused with something brought to the present from a few hundred years ago, but it worked well. The climax was a titchy bit lacking in climactical momentum (aka a big WOW moment), but by the end of the novel I wanted more. The Power of Dark reminded me so much of the fantasy books I used to devour when I was younger. There's a magical tone–that special spark–that many fantasy novels don't have, but I'm glad to say that this one definitely did. Robin Jarvis is a talented storyteller, and I'm looking forward to reading the rest of the series. It's always great to hear about a new Robin Jarvis book; although I found his work rather later in life than his intended audience, his work has a deliciously macabre element to it that really appeals to the horror fan in me, and his working of historical and mythological elements into the weave of the story adds another dimension. Whilst a fan of his poor, set-upon and oft-betrayed furry animals, I've always rather enjoyed The Wyrd Museum and The Whitby Witches trilogies just that tiny bit more It's always great to hear about a new Robin Jarvis book; although I found his work rather later in life than his intended audience, his work has a deliciously macabre element to it that really appeals to the horror fan in me, and his working of historical and mythological elements into the weave of the story adds another dimension. Whilst a fan of his poor, set-upon and oft-betrayed furry animals, I've always rather enjoyed The Wyrd Museum and The Whitby Witches trilogies just that tiny bit more, so when the words 'It is time to go back...' appeared on his website, all thoughts of whether we'd ever see more of the Reflected Realm were temporarily banished. And it's a good book, it really is, a perfect pastiche of everything that makes Robin's writing great. Cherry is a delightful mixture of Ted and Alice Boston; hints of Lantern from Deathscent appear in an automaton butler; the Lords of the Deep have a servant equally as sinister as that of the original Trilogy, and—oh, those poor, poor... well, no spoilers, but it's a grisly breakfast to rival Swazzle's effervescent sausages. I'm always thrilled when a new Robin Jarvis book is announced and to add to my excitement this time it was the start of a new series set in Whitby after the Whitby Witches trilogy. There are Jarvis staples here - ancient powers, a curse enacted through the events of today, mysterious inventions and dark creatures - and all blended with the author's personal flair for dark charm, humour and the truly disturbing. In Lil and Verne we have two great new characters and while I will always miss Alice Boston, Cherry Cerise is growing on me. I would hate to spoil the plot for anyone but I will say if you've ever attended Whitby Goth Festival there's some special chuckles in here just for you - the way Jarvis has neatly twisted a more or less friendly competition to fit his narrative is genius. But if you want to know more about Scaur Annie the ragged witch and her gentleman, Melchior Pike, or about the mysterious Mr Dark, or even for a glimpse at the Aufwaders (a few familiar from the original trilogy) then you'll just have to read it. For me this lacked the chill factor of the original trilogy but then I read that when I was twelve and now I'm...er well a lot older than that. I am genuinely jealous children coming to Jarvis' work for the first time through this book - all that awesomeness ahead of them. So while I prefer the original books, I really enjoyed this and can't wait to see what lies ahead for Lil, Verne and Cherry next. Back in Whitby again with Robin Jarvis in the first of his new trilogy The Witching Legacy. Twenty years on from The Whitby Witches" the town has moved on now in the age of Steam Punk and Goths. The new Whitby Witch Cherry Cerise is deliciously eccentric and colourful. She is joined in her battle to save Whitby by two friends Lil and Verne. In this book we meet old friends such as the Aufwaders but also darker forces who threaten the town such as Annie Scaur a 17th Century Witch, Melchoir Pyke and Back in Whitby again with Robin Jarvis in the first of his new trilogy The Witching Legacy. In this book we meet old friends such as the Aufwaders but also darker forces who threaten the town such as Annie Scaur a 17th Century Witch, Melchoir Pyke and the sinister Dark. Robin Jarvis intertwines their story with that of Whitby itself. Loved the illustrations throughout the book by the author himself especially the sketch of the old Aufwader with his wrinkled weather beaten face wearing his fishing hat and Guernsey. This was a fast satisfying read, again loved how Robin jarvis brought Whitby to life and incorporated the old tales and superstitions associated with the town whilst adding his own magic. Set in his favourite Whitby , the Yorkshire town is threatened with destruction by an ancient evil force Forget Dracula this is much more terrifying ! Two best friends Lil and Verne live in the town . They think the worst they have to fear is an extremely fierce storm heading their way . How wrong can they be ! Reading this was a sheer joy. It took me back to my childhood- it was just like being 9 and discovering The Whitby Witches for the first time. The original Whitby trilogy marked the first time I had been frightened by a book. I didn’t realise that reading could exhilarate you in that way. Reading The Power of Dark has brought it all back to me. It has real moments of horror and a sense of the macabre in places but also has lovely moments of humour and warmth. I absolutely love the character of Ch Reading this was a sheer joy. It took me back to my childhood- it was just like being 9 and discovering The Whitby Witches for the first time. The original Whitby trilogy marked the first time I had been frightened by a book. I didn’t realise that reading could exhilarate you in that way. An imaginative tale for a younger audience. I enjoyed that the story at heart is about these two best friends, Lil and Verne, who have to weather out a storm, both figuratively and literally, while their city becomes the center of an ancient battle. I also loved how Robin Jarvis added depth to the story by interweaving a historical narrative into the present day, all the while maintaining the wonderful magical and gothic goodness that makes the characters and the town of Whitby come to life. I'm not saying it was bad but it was a 2.5 for me. I love Robin Jarvis by the way, grew up on his books and was delighted to see some new ones, and Whitby ones as well. But the possession-based story was like a less good Dancing Jax. It had it's good moments and has probably done enough for me to finish it, but seemed a bit superficial overall. I definitely preferred the Dancing Jax series. I was a tad worried that this softer tale meant Jarvis was losing his (deathly) touch, compared to the gruesomeness of his early work. Then something awful happens to a couple of hamsters and I was reassured. It might be softer, but the bite is still there. Jarvis takes the tourism brought to Whitby by the Goth and Steampunk weekends and blends it with the myth, history and lore of the town. Part magic, part horror, and just enough cogs to keep things ticking. Gadgets vs Goths what's not to like? This was entertaining. Not as great as the Deptford Mice but a nice Whitby read for October. More like a 3.5, this sort of follow-up to the Whitby Witches series doesn't feel very original because of its use of all the old lore from those books. Still, it does get going towards the end and does come up with some unique ideas. 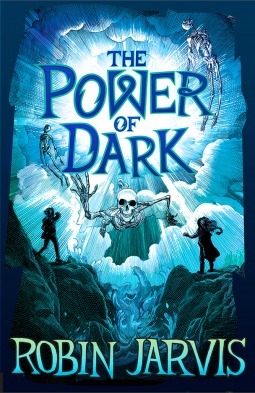 Robin Jarvis writes fantasy and horror for children and teenagers, and The Power of Dark (out on 2 June) is his latest novel. Although I was aware of Robin Jarvis's books, I'm just old enough to have missed out on them as a child, as I was 13 or 14 when his first novel was published, and by that point I was mostly reading books aimed at adults. This is a shame as, judging from The Power of Dark, I would have liked Jarvis's books a lot when I was reading from the 9 - 12 or teen shelves in the lib Robin Jarvis writes fantasy and horror for children and teenagers, and The Power of Dark (out on 2 June) is his latest novel. Although I was aware of Robin Jarvis's books, I'm just old enough to have missed out on them as a child, as I was 13 or 14 when his first novel was published, and by that point I was mostly reading books aimed at adults. This is a shame as, judging from The Power of Dark, I would have liked Jarvis's books a lot when I was reading from the 9 - 12 or teen shelves in the library. The town of Whitby on the North Yorkshire coast, home to friends Verne Thistlewood and Lil Wilson, is no stranger to the supernatural and for good reason it seems, because something is brewing in the storm about to sweep over it. The town legend of the brief liaison between magician Melchior Pyke and the witch Scaur Annie which created a mysterious invention, known as the Nimius, and their subsequent betrayal by Pyke’s evil manservant Mister Dark, is about to make itself felt in the present day, The town of Whitby on the North Yorkshire coast, home to friends Verne Thistlewood and Lil Wilson, is no stranger to the supernatural and for good reason it seems, because something is brewing in the storm about to sweep over it. The town legend of the brief liaison between magician Melchior Pyke and the witch Scaur Annie which created a mysterious invention, known as the Nimius, and their subsequent betrayal by Pyke’s evil manservant Mister Dark, is about to make itself felt in the present day, with a vengeance. A Robin Jarvis book is always something to look forward, no matter what age you are, and follows the usual form. Expect a highly imaginative story (bizarre inventions meet old magical entities) with terrific atmosphere (Whitby at its most storm lashed) scary bits (anything to do with Mr Dark) and lots of and great characters (the flamboyant witch Cherry Cerise). Lil’s parents are the owners of an occult shop who insist on dressing in black ‘with a strong Victorian twist. As Lil’s wardrobe endures the same fate, her choice of rebellion is to be an imaginative, stealth yarn bomber, using bright colours as an antidote to Whitby’s acquired Goth heritage. Verne’s parents run an arcade. They have a fascination for everything steampunk and his father harbours a particular passion for automatons, the latest acquisition he is trying to repair being a particularly grisly subject. Lil and Verne are younger protagonists than you would expect from a young adult novel, although this is in many way a book with an ensemble cast, which should give it a wide age range appeal (including adults like me who place Jarvis’s books in the ‘curl up with a large hot drink and a plate of biscuits’ enjoyment category). It is a book that will take more than one reading to properly scoop up all the details and enjoy the often juxtaposed mix of humour and light horror. The Power of the Dark is a Box of Delights type of book where there's a sinister hidden world existing in parallel to the one you know and can see, unless you’re a witch like Cherry. This becomes evident as Whitby becomes gradually and wonderfully skewed out of reality as the supernatural and gruesome elements begin to take over and East and West Whitby square up to one another for a great battle, when past collides with the present in what is essentially a time slip novel. I have not yet been to Whitby, but do feel this is the type of book that encourages a visit to the place, just to take a tour round the story. But when I go I will be expecting to see skeletons tumbling out of the church yard, Cherry steaming through the streets in shocking pink attire, and evidence of Lil’s knitting stretched over Captain Cook’s whale bone arch, or there will be complaints. Robin Jarvis is back with a new series, this time returning to a place he hasn't been (at least in writing) since the 90s - Whitby. Back then, he wrote a trilogy books about The Whitby Witches which set up an elaborate mythology for the town. The old ladies of the town practised magic, dark things stalked the streets, there were the Lords of the Deep and Dark out in the ocean, and a race of small beings called aufwaders that you could only see if you had the second sight. It was entertaining stu Robin Jarvis is back with a new series, this time returning to a place he hasn't been (at least in writing) since the 90s - Whitby. Back then, he wrote a trilogy books about The Whitby Witches which set up an elaborate mythology for the town. The old ladies of the town practised magic, dark things stalked the streets, there were the Lords of the Deep and Dark out in the ocean, and a race of small beings called aufwaders that you could only see if you had the second sight. It was entertaining stuff (now sadly all out of print) and clearly a place Jarvis has been wanting to return to in his fictional worlds. This new series (which I believe will be called The Witching Legacy) drops hints and references to the earlier books - so if there are any long-term Jarvis readers like myself, we can pick them up. But for anyone who is new to the Jarvis world, the story stands alone completely by itself. I had to look this up on the internet, because not living in England, I'm less familiar with it - but since 1994 (so slightly after Jarvis started his initial trilogy) Whitby, a small seaside town near Yorkshire, started having a regular Goth weekend. So for the last 20+ years, a large number of people - from a surprisingly diverse range of ages - enjoy themselves by dressing up in goth or steampunk gear for the weekend. Clearly, this was inspiration enough for Jarvis, who has created a tale of an ancient run-in between a witch (Scaur Annie) and a mechanical wizard (Melchior Pyke) which becomes re-ignited in modern-day Whitby. Two youngsters, Lil and Verne, become caught-up in this feud, as the Lords of the Deep and Dark seek to wreak chaos against Whitby again. It's not a very long read, so I'm loathe to say much more for fear of spoiling the story, but it features all the Jarvis trademarks: black magic, pretty horrific bad guys (including a deliciously nightmarish character called Mr Dark, whose name is in the title), some creepy scenes, very English characters, and a palpable sense of location. I'm pretty sure, if you read this, you'll want to visit Whitby. I certainly do. Young fans of darker fantasy, who love the idea of floating skulls and exposed skeletons being whipped around by a storm, will find plenty to enjoy here. This first in a new series, is set in Whitby and makes full use of its popularity with Goths and fans of the macabre, but it also makes the most of its humour and is firmly aimed at its younger audience. Lil and Verne have been friends forever. Lil’s parents are witches who run an occult shop and are walking advertisements for the arca 3.5 stars. Lil and Verne have been friends forever. Lil’s parents are witches who run an occult shop and are walking advertisements for the arcane. Lil couldn’t be more different: she doesn’t believe in magic, she hates wearing black and she has big plans to shake up the entire town through the power of knitting. Verne’s family couldn’t be more ordinary, running the local arcade, but he longs for all the things Lil despises – magic and mystery and the mayhem of a zombie apocalypse. Despite their differences they’re great friends. I liked Lil more of the two, since she’s strong-willed, knows her own mind and is much more involved in the story than Verne. I liked him to begin with too, but his character sort of fades out as the book goes on. Sadly, like some of my enjoyment. It all starts really well, with darkness and foreboding and a storm and some amazing scenes that are fabulously horrifying. Then comes the mystery and the magic and mayhem right up almost to the end – but, for me, I felt the Scaur Annie side of things was a bit dull and predictable, lacking the same spark and menace as the earlier part of the book. I wasn’t particularly convinced by the way some things were resolved either, feeling a little letdown after such a great buildup. I wasn’t sure how any of it could be resolved, and then… well, I was left a little underwhelmed, and I’m pretty convinced ten-year-old me wouldn’t have been all that happy either. Which is a shame, because for the most part this book is great fun, has some amazing ideas (the steampunk stuff is brilliant) and plenty of unsettling dark moments. The characters are interesting, there’s a nice sense of menace and there’s plenty of scope for more to come. If there’s a young reader in your life who likes ghoulish tales and a bit of dark magic amidst the light, then they’ll probably enjoy this. It’s well written and enjoyable, and hopefully they’ll like the ending more than I did. As a child I loved Robin Jarvis's The Whitby Witches trilogy, all the more because my Dad is from Whitby and Jarvis's writing perfectly evoked the spookiness of the town. When I discovered there was to be a new series set in Whitby, I pre-ordered without question and was so glad that I did. The illustrations throughout the book - also by Robin Jarvis - were fantastic additions and enhanced the plot. Especially the drawings of the fisherfolk, some of whom I believe also featured in the original Wh As a child I loved Robin Jarvis's The Whitby Witches trilogy, all the more because my Dad is from Whitby and Jarvis's writing perfectly evoked the spookiness of the town. When I discovered there was to be a new series set in Whitby, I pre-ordered without question and was so glad that I did. The illustrations throughout the book - also by Robin Jarvis - were fantastic additions and enhanced the plot. Especially the drawings of the fisherfolk, some of whom I believe also featured in the original Whitby Witches trilogy. Nice additions such as the lucky ducks and Botham's the bakers, which only residents or visitors to Whitby would recognise. This gave the story so much authenticity. My favourite character was Lil, as I enjoyed the idea of her rebelling against her parents and against Whitby as this is a very real situation for a young person living in such a small fishing town to go through. I was also intrigued by the Frankenstein-like Mister Dark. The use of text messages between Verne and Lil was an effective way of providing setting and bringing the novel into the present and mixed well with the scenes set in the past. Received on NetGally for honest review. At first, I wasn't too sure on this book and it took me a little while to get into the it and to focus. Once I did, I thoroughly enjoyed it. There was mystery, scares and a lot of weird and wonderful stuff going on. It isn't overly scary for the children and something that boys will certainly enjoy, along with the girls. There is a great plot to the story, and it isn't one that is so predictable that you can work out the whole book after just reading the f Received on NetGally for honest review. There is a great plot to the story, and it isn't one that is so predictable that you can work out the whole book after just reading the first few pages. I was well into the book when things finally started clicking into place for me. The characters are also well crafted and described in the book. it's easy to imagine them and bring them to life in your mind while you are reading. Ok, firstly wow! I haven't read any robin Jarvis since I was 10 and I remember liking him, but this is stunning! It charges along fizzing with energy. The characters are beautifully drawn and the atmosphere of the novel is amazing. This is not a story for kids, it's a book for everyone. My only, slightly contradictory concern is that the horror element of this is genuinely very creepy so it might be too intense for some younger readers. That being said, who cares! They should grow a pair! Life c Ok, firstly wow! I haven't read any robin Jarvis since I was 10 and I remember liking him, but this is stunning! This was the first book by Robin Jarvis I had read in a long time and I loved it. The storyline with all the magic, mayhem and mystery kept me hooked and it was great to revisit Whitby again as I loved the Whitby Witches trilogy. I loved the characters, particularly the wacky mysterious Cherry Cerise and look forward to learning a bit more about her in subsequent books. I eagerly await the next instalment of what I think will be a fantastic series. Not since the publication of the Wyrd Museum se This was the first book by Robin Jarvis I had read in a long time and I loved it. The storyline with all the magic, mayhem and mystery kept me hooked and it was great to revisit Whitby again as I loved the Whitby Witches trilogy. I loved the characters, particularly the wacky mysterious Cherry Cerise and look forward to learning a bit more about her in subsequent books. I eagerly await the next instalment of what I think will be a fantastic series. Not since the publication of the Wyrd Museum series have I enjoyed a Robin Jarvis story so much. Whitby is a town that holds secrets - and they're about to take over. An ancient feud has been resurrected and is being played out through two young friends. The two halves of the town will be involved in an epic battle - will Whitby survive? I thoroughly enjoyed this story , loved the idea of the two halves of the town being goths or steampunks, wonderful pictures created in my head. Witches, a doomed love and a mechanical versus natural forces fight - intriguing and a definite page turner. A few weeks ago I said to myself that I should read more Robin Jarvis and I'm glad I did. I loved this book, it was exactly what I was looking for. Hopefully I have time before the next book to read the Dancing Jax trilogy. A fast-paced story with something for everyone - magic, witches, goths, steampunk, scientific inventions, a possible apocalypse and a touch of will-they won't-they romance! A very visual story, aided by some good illustrations. Witches, steampunk, ancient feuds, magical creatures ... a great read! I enjoyed this rather scary book, which is a fight between magic and science, set in the seaside town of Whitby.